Jen and Ink: New Art and a Giveaway! New Art and a Giveaway! I finished a new piece over the weekend. After hours of stippling its time to show it off. "Come Sit Next to Me" measures 8" x 8" and it was created on cradled hardboard. Though I have made many chairs, this is my first couch, and I'm quite pleased with the results. This piece is made entirely of magazine (I usually put some plain paper in these pieces) and was finished off with a little black Prismacolor technical pen and a while gel pen. I can't help but stipple.....It adds that little bit of character and dimension. The "Come Sit Next to Me" original is not yet for sale, but it is available as an 8" x 8" archival print in my Etsy shop. I've also decided to give away one of these prints! Yahoo! Freebie! Just leave me a comment on this post and make sure I have a way to get a hold of you. Blogging about this contest, linking to this post. * Make sure you let me know you've done these things so I can give you the extra entries. Winner will be announced Monday morning. Lovely piece!!! Just re-posted on FB. I'd love to sit next to you and create some art Jen! This is a beautiful piece! I love your work! It's so so inspiring. This is a beautiful piece, and who doesn't love some stippling! I know I do!! Great work! 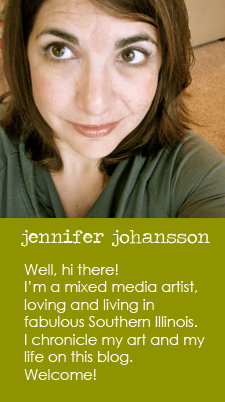 Hi Jennifer, Love your work! Love the new piece! I was already following & I just tweeted! Great new piece...love your work! ooh! can i live in that room? wow! i'm excited to discover your blog today through scoutie girl's fb. I'm amazed that you created this piece entirely from magazines! I love everything paper related! (i'm a mixed media artist as well and use patterned scrapbook paper.) we're actually having a giveaway right now as well - so stop over and say hello. and I'm a follower now! 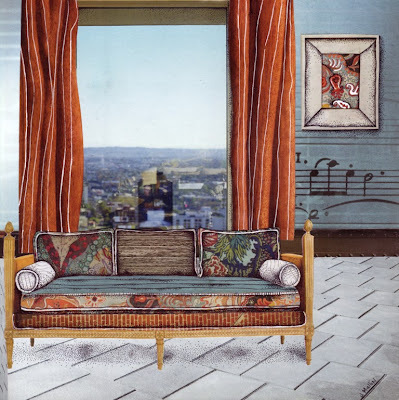 great piece, love the couch! Fantastic - I would love to enter! 1. Already following your blog!